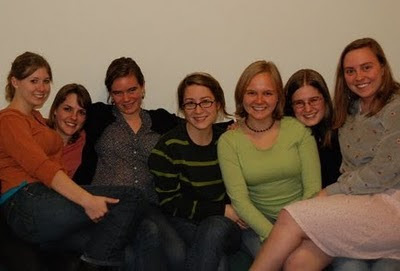 I grew up with six beautiful girls in the leafy green university suburbs of Atlanta. Not bound by blood (except for two), but by those early life experiences that pull people together, church and school and slumber party sisters. I imagine us, various shades of blonde hair and even more assorted shades of personality, in one living room or another, licking cookie dough off the spoon in between giggle bursts or imagining where we'll be when we're 28. (How many honorary parents and siblings did we gain in these years? So hard to keep track...) Ten years old, then fourteen, then seventeen -- our conversations were genuine and seeking, frustrated and celebratory. The energy of seven incredibly diverse souls finding their ways in the world even when the world seemed small or scary or incomprehensible. We sang, we dressed up, we went camping, we stayed up late, we fell out of love and in again. We grew. Every college Christmas break, we'd gather to recount the last twelve months we'd spent apart. How different each of our paths have become, rooted in the same beginnings! Berkeley, Davidson, Wesleyan, Emory, Tech, bioengineering, English, global health, environmental science, philosophy, sociology, biology, communications, Spain, England, Italy, New Mexico, Paris... there were always new parts of ourselves to explain, to take pride in, to add to our foundations. Nothing off limits, and there have been very hard things, and there will still be. There have been great things, and there will still be. We sit in a circle with our champagne -- and cookie dough -- and we pick it all back up. Yesterday morning, I sat in a smooth wooden diner booth with three of my stalwarts, surrounded by transitions and questions and the loud construction work outside, major renovations to the road where we grew up. We'd managed to slip breakfast into our schedules; I was in town for fifteen hours, the others went late to work and classes. I looked around the table and marveled at -- well, at us. We hardly ever see each other. We all have friends that we see more often, and who know us better at this point in our lives. We are not who we were in high school. We don't know the next plan, location, or adventure. We are grasping at straws we are rootless we are rooted we are learning. We see the world in the ways we do because of individual experiences, separate from each other, but also because of our time together and the deep full nurturing it provided. I do not believe that I would have gotten anywhere close to understanding and appreciating who I've been and become without their eyes and ears and thoughts. And when we do come back together, their insight gives me hope and encouragement and laughter still. As we walked out into the blazing sun and the roaring jackhammers and said goodbye, I was reminded that our lives will always intertwine, the energy of these seven women will always fall messy, powerful, beautiful, into place.